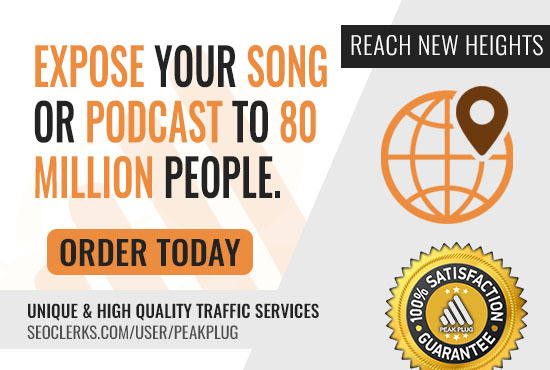 Need To Get Your Song Or Podcast Noticed Online? We Have The Right Solution For You! No Bots. No Proxies. No exchange. No Bull. **This service is for an ad campaign to get traffic and gain more exposure. **You will not receive 80 million visitors, your link will be exposed on our network Of 80 million daily visitors, however to protect you the advertiser we demand a minimum of traffic from our publisher which ever amount you purchase from us. Over 10 Years Experience, Buy With Confidence!